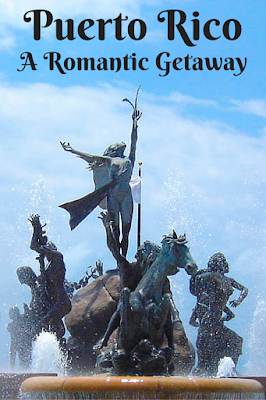 There’s something romantic about Puerto Rico. The cobblestone streets bordered by brightly colored buildings. The architecture that makes you feel like you might be in Europe. The prickly heat that can quickly turn into buckets of water falling from the sky, but only for long enough for the two of you to duck into a bar to dry off and share a sangria and a laugh. The sandy beaches and warm water that beckon you in for a swim. Puerto Rico is most definitely a romantic destination for couples. The couple under the balcony know how to wait out a rainstorm. I actually took a trip to Puerto Rico years ago, ten years ago to be exact, but it wasn’t with my other half. I got to tag along on a trip with some friends, and there was only room for one. We had a wonderful time, but I kept wishing Romeo was there with me to experience this beautiful and romantic Caribbean island. 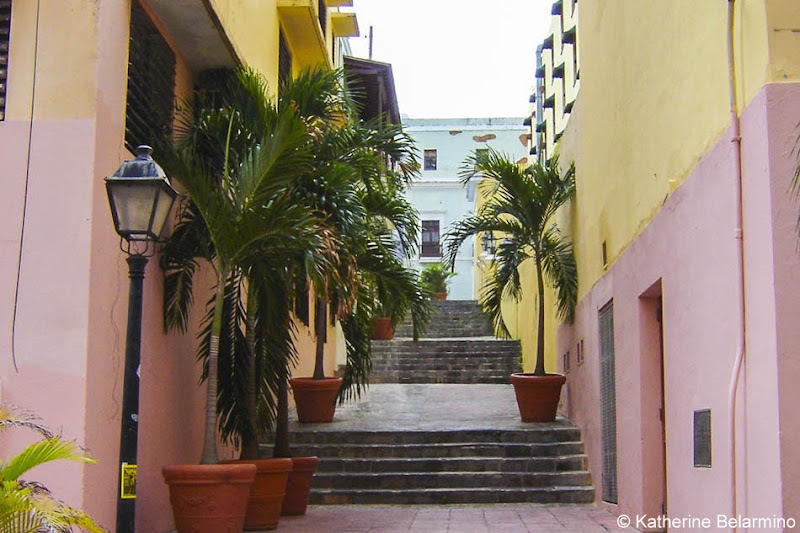 Old San Juan is full of colorful streets and alleys. The blue cobblestone streets of Old San Juan are meant to be strolled walking hand-in-hand. This walled city, a relic of the Spanish Empire, is filled with colorful colonial architecture from hundreds of years ago, charming plazas, and delightful restaurants and bars. 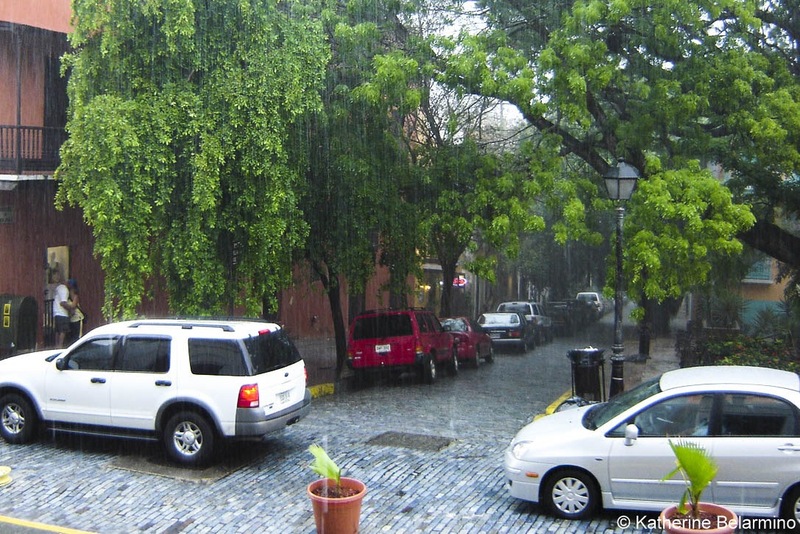 Old San Juan is also a UNESCO World Heritage Site. Catedral de San Juan Bautista. 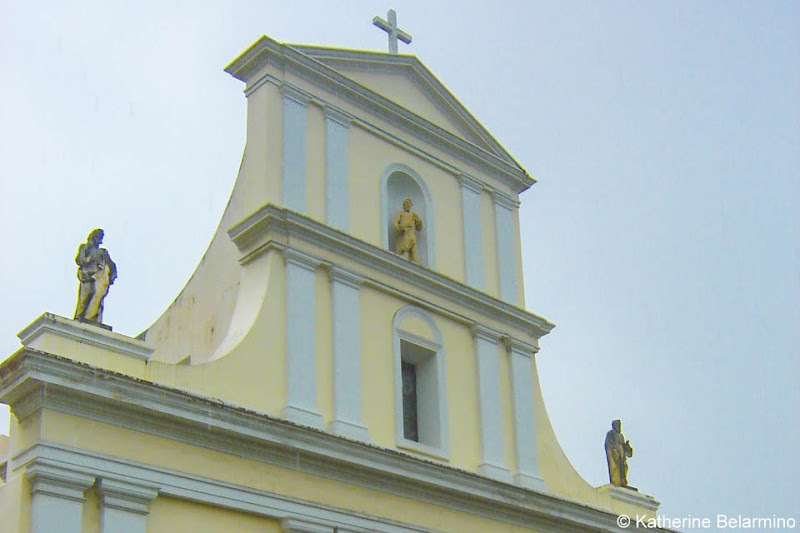 One of the oldest buildings in Old San Juan is the Catedral de San Juan Bautista. It is also one of the oldest cathedrals in the Americas. The current cathedral, which was built in 1540, replaced the original thatch-roofed church that was destroyed in a hurricane in 1529. The Spanish explorer Ponce de León is interred in the cathedral. The wax-covered mummy of St. Pius, one of the first martyrs of the Roman persecutions, can also be found in the cathedral. I’ll warn you, if you look close, it’s kind of creepy, but a very important relic. The central courtyard of Hotel El Convento. 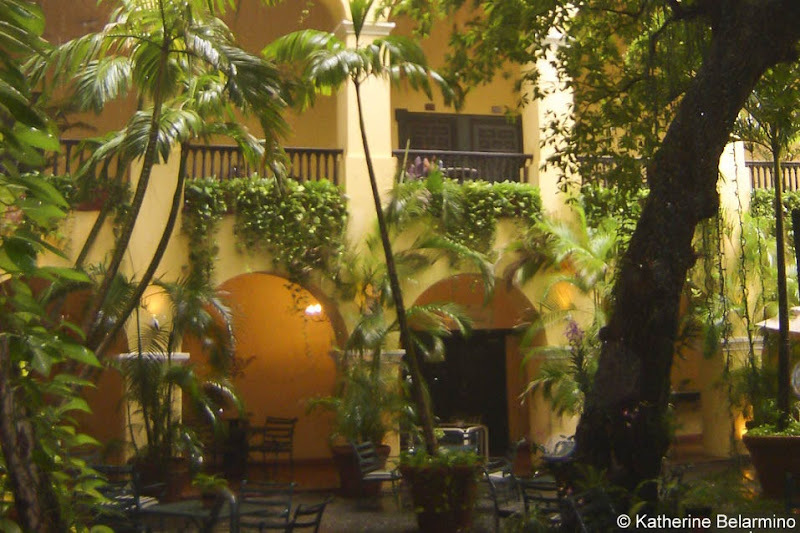 If you plan on staying in Old San Juan, the most romantic hotel is Hotel El Convento, across Plaza de las Monjas (Nun’s Square) from the Catedral de San Juan Bautista. The Hotel El Convento first opened in 1651 as a Carmelite convent. The convent fell into disrepair in the early 1900s, serving as a store, a dance hall, and then a flophouse, but was restored and opened as a hotel in 1962. This beautiful Puerto Rico hotel is decorated in the Spanish Colonial design with wooden beams, handcrafted tiles, carved furniture, and old-world style. Views of the city walls and San Juan Bay along Paseo del Morro. The intact city walls of Old San Juan can be viewed on a romantic stroll along Paseo del Morro. A walk along Paseo del Morro can start at the romantic Raíces Fountain, which was erected to celebrate the 500th anniversary of the New World. 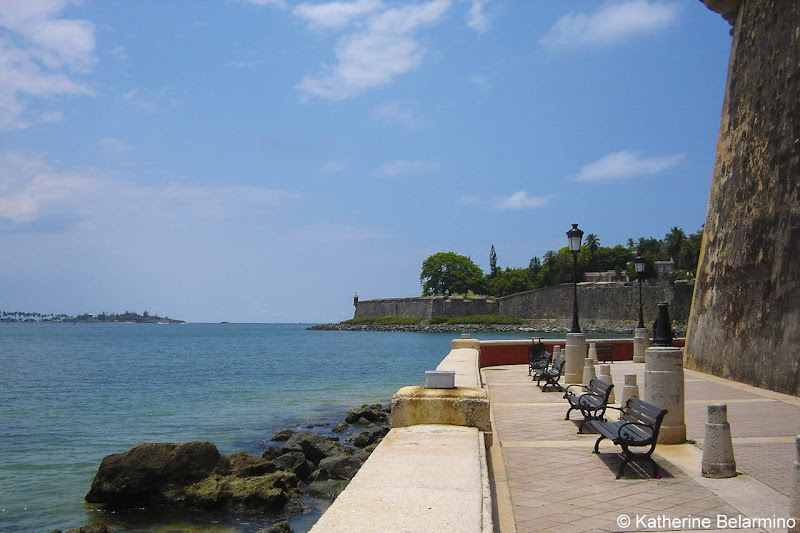 The Paseo del Morro offers views not only of the city walls but also of and across the Bahia de San Juan. 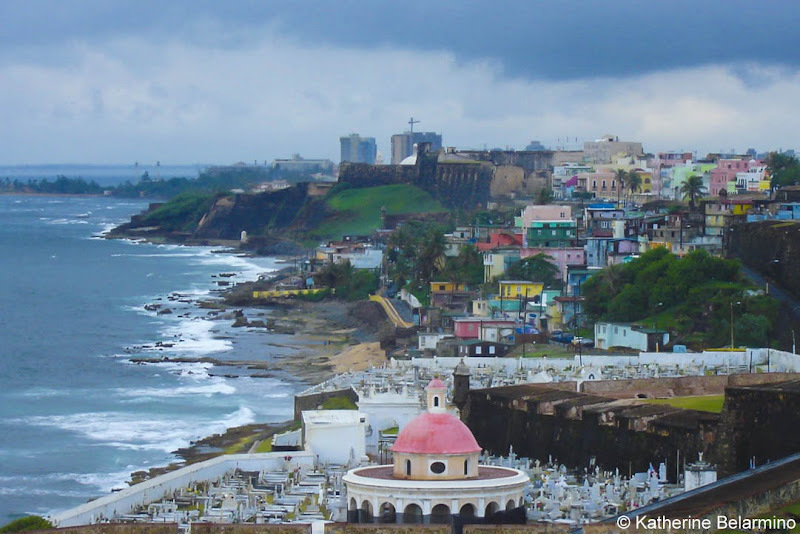 View of San Juan from Castillo de San Felipe del Morro. The Paseo del Morro leads to the Castillo de San Felipe del Morro. The fort overlooks the entrance to San Juan Bay. The foundation of El Morro was laid in 1539, but the fort was completed in 1787. During World War II, the US added an artillery fire control station. The lawn also provides a panoramic view of San Juan. Castillo de San Felipe del Morro overlooking the Cementerio Santa María Magdalena de Pazzis. Below the Castillo de San Felipe del Morro is the picturesque Cementerio Santa María Magdalena de Pazzis. 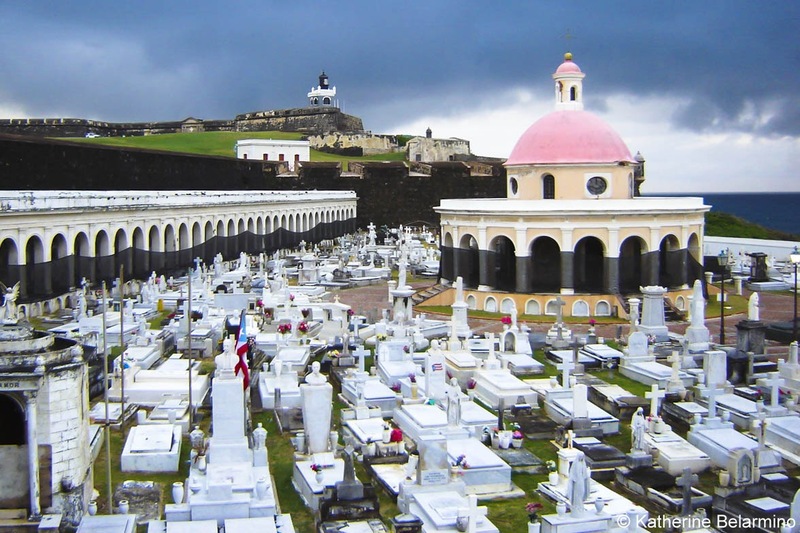 The marble tombs and monuments are the final resting places of some of Puerto Rico’s most famous and influential citizens. The cemetery is close to La Perla, the infamously dangerous neighborhood of San Juan, but the cemetery is safe to visit during the day. Puerto Rico’s attractions are not limited to Old San Juan. If you have a rental car, drive to the Parque de las Cavernas del Rio Camuy, a cave system with the third largest underground river in the world. 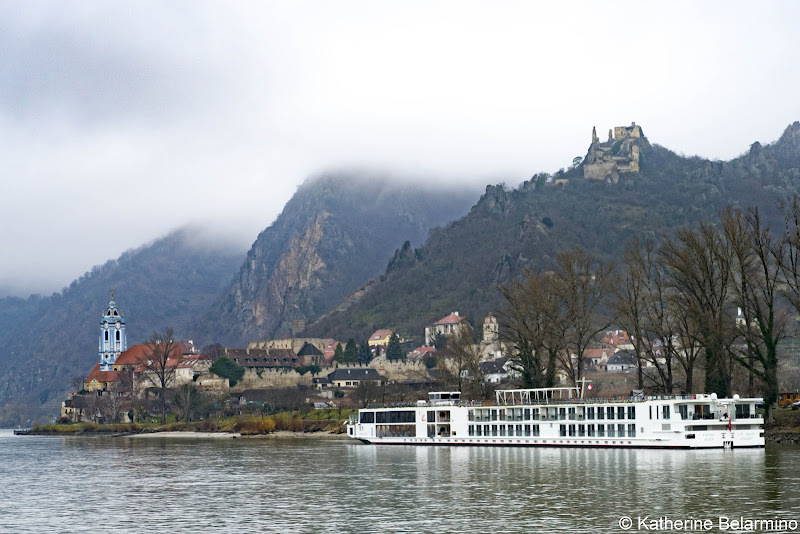 The caves can only be explored on a guided tour, which starts with a ride on a trolley and then a walking tour. Tours can be canceled when it rains, so check the weather before making the drive. Another of Puerto Rico’s natural sites is El Yunque National Forest, the only rainforest in the United States under the protection of the National Forest Service. El Yunque has flora, fauna, waterfalls, and scenic hiking trails. One of the beaches of Vieques. 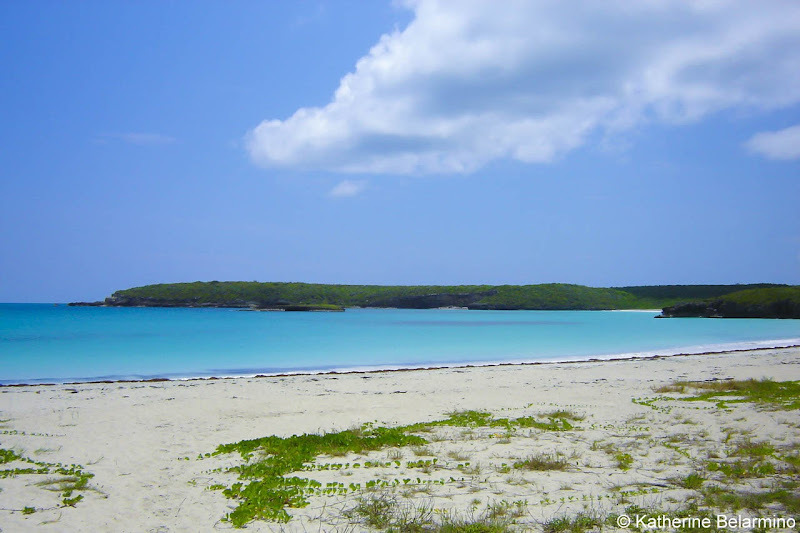 As Puerto Rico is an island with 270 miles of coastline, there are obviously numerous beaches from which to choose. 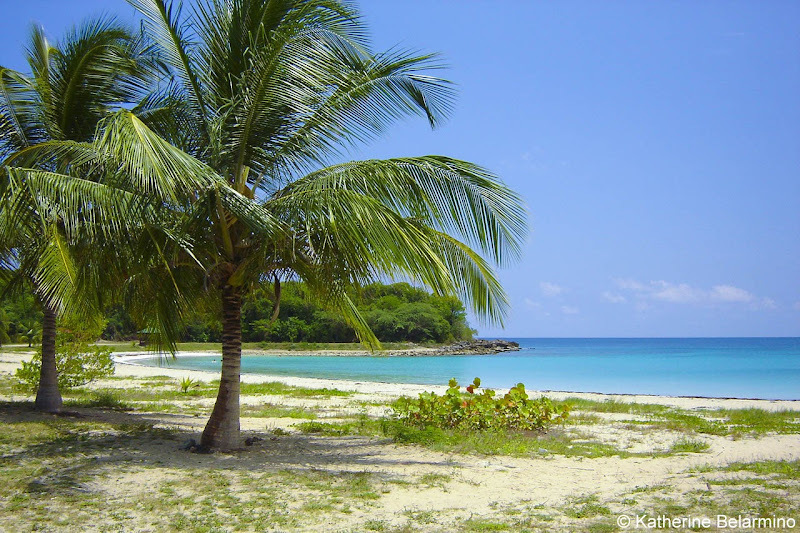 One of the best beaches for beauty and snorkeling is Playa Escondido on the east side of the island. If you are really looking for a romantic place to enjoy the sea and sand, take a ferry to one of Puerto Rico’s secluded islands. Much of the island of Vieques used to be under the control of the US military. Now some of the island’s best beaches are open to the public and travelers can spend the day on a beach with white sand and clear blue waters, perfect for sunbathing and snorkeling. 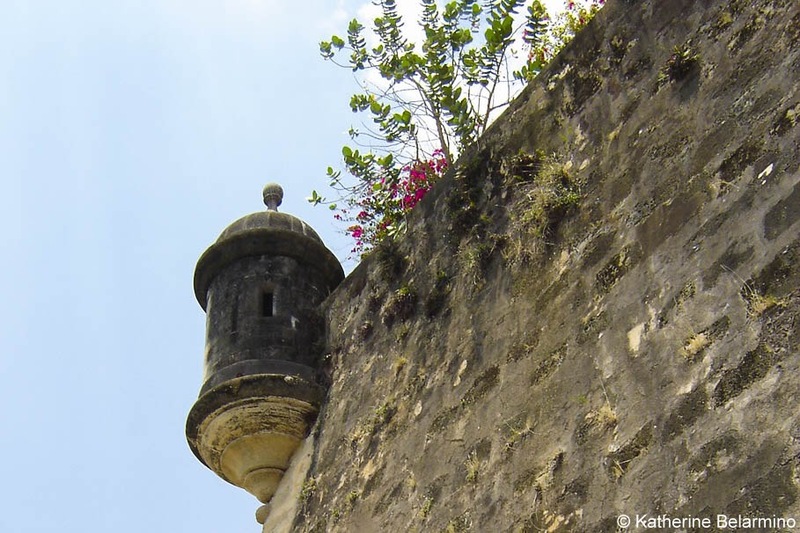 One of the iconic turrets of the wall surrounding Old San Juan. Puerto Rico is a romantic Caribbean island perfect for a couples’ getaway. Whether you are visiting for a few days or a week, there are plenty of things to do in Puerto Rico. Hopefully I’ll get the chance to return to Puerto Rico, but this time with Romeo by my side so we can make memories in Puerto Rico together. This article was sponsored by See Puerto Rico. Visit their website to learn more about how you can live your own 5-star vacation story in Puerto Rico. Disclosure: This article contains affiliate links. 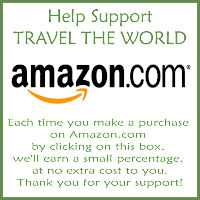 If you book through them, it costs you nothing extra, and we earn a small commission that goes towards running this website. 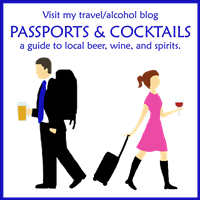 What would you like to do in Puerto Rico with your significant other?